202.269.2150 .1812 HAMLIN STREET NE WDC 20018. 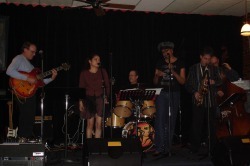 An entertaining group performing a mixture of Jazz standards and original Jazz and Blues material. Roots. Reggae. Rock. Claw band is the first reggae band to perform at Saint's Bourbon Street and their Carribean flavor and excellent musicianship keeps everyone coming back, regardless of genre preference. You dont want to miss their next performance! That’s what First Thing Smokin’ Blues Band is all about. Get the dance party started. ...fast and funky. 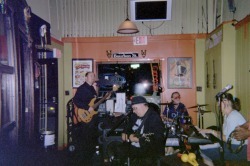 We play old Blues with the flavor of Soul, R&B, Funk, Swing, Jazz, and Country. Not your standard run-of-the-mill blues band . This band specializes in covers from the sixties and beyond! From MoTown to your town, by the end of the night you will be singing some of your favorite songs! When you are in a mood to reminisce and feel like you really are hearing that Down Home Flavor, Floyd is who you need to come to hear! 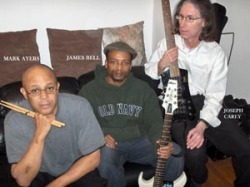 This Band was formed in January of 2009 and is composed of 3 pieces, guitar, bass and drums. 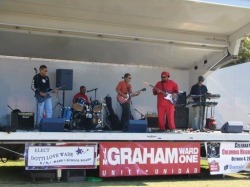 The guitarist, James Bell is the founder of the group. He has 30 years of playing experience and has performed with concert jazz groups Chemistry Band in DC, The Night Moves in MD, The Harlem Jazz Workshop in NYC, The York College jazz ensemble in Jamaica, NY. He lived in New York City for 12 years, went to school for music theory at Long Island University and York College in Jamaica, NY, and has performed at the Blue Note Club in New York, the Village Gate, NYC, and private parties. 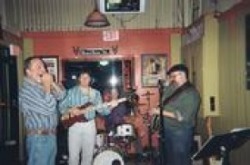 Meteors Blues Band has Memphis roots, Cajun flavor, and National fame. Its no wonder that when you hear the Meteors you feel like you are in heaven! 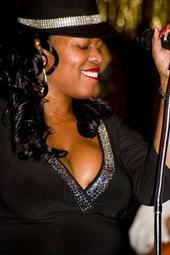 Stacy Brooks has been singing since the age of 5 starting in Zweibruken Germany. She has sung with many bands and recorded with other great artists. However, early February 2007, a promoter contacted her through MySpace to open for Legendary Blues Man Lonnie Shields in Wilmington, Delaware. Stacy decided it was time to break out as a solo artist and as a result was nominated for a WAMMIE for “New Artist of The Year” by the Washington Area Music Association that year. Compiled with members from former bands, Stacy debut The Stacy Brooks Band at Saint’s Bourbon Street Restaurant. Fast forward to 2009, as executive producer Stacy is about to release her highly anticipated debut CD titled, “Love, Peace & The Blues. This CD boast’s 7 songs Stacy wrote and also a duet with Legendary Blues Man Kenny Neal. The co-producer’s are Kenny Neal and Memphis Gold. Come by, you never know who will stop in to play when she is at Saint’s Bourbon Street Restaurant. Ursula Ricks Project is a group of players carefully selected by Ursula. Comprised of electric bass, lead guitar, drums and sometimes keyboard and harmonica. They are a power driven force that can stand on it’s own and does when Ursula yields the floor to solos that engender hoots and celebratory applause. Ursula Ricks Project is smoky, sizzlin’ and tight. The sound of Ursula Ricks first presented itself at the 8x10 in 1990 with her then band ‘ArJuHi’ for an open jam. Ursula has a huge performance history in Baltimore and the surrounding area’s in and outside of Maryland. Ursula has played Artscape, Baltimore Blues Festivals, Café Tattoo, Café Hon, Cat’s Eye Pub, Full Moon Saloon, Belvedere Hotel, Laurrapin Grill Havre de Grace, Waterfront Fells Point, and Old Bowie Towne Grill to name a few. Ursula Ricks Project also is available for private functions. The repertoire includes outstanding classics such as Down Home Blues, The Thrill is Gone, You Shook Me, Nighttime is the Right Time, Little Queenie, and Somthin’ on Your Mind. 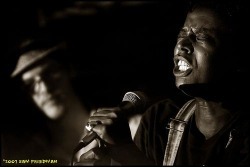 Ursula Ricks Project is a dynamic blues band that leaves a powerful and distinctive impact. They are here in the tri-state region, and they’re the talk of town. 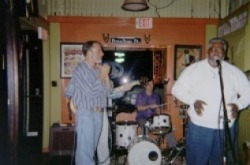 Whale Etoufee Split off in 2005 from Chris' longtime blues band BLUES MUSEUM, after Chris' return from his second extended sojurn in New Orleans, meeting, befriending, and playing with local musicians there. Long versed in standard, classic and Chicago Jazz and Blues, Chris declared in his July and August columns in Alexandria's OLD TOWN CRIER newspaper that he was going to devote his full time and attention to New Orleaniana from now on. 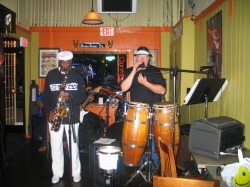 Since the disasters of Katrina and Rita, Whale Etoufee has performed to raise funds for the afflicted of the Gulf Coast on numerous occassions.